"Luke was born in Antioch. In his youth, he excelled in his studies of Greek philosophy, medicine and art. During the ministry of the Lord Jesus on earth, Luke came to Jerusalem, where he saw the Savior face to face, heard His saving teaching and was witness to His miraculous works. 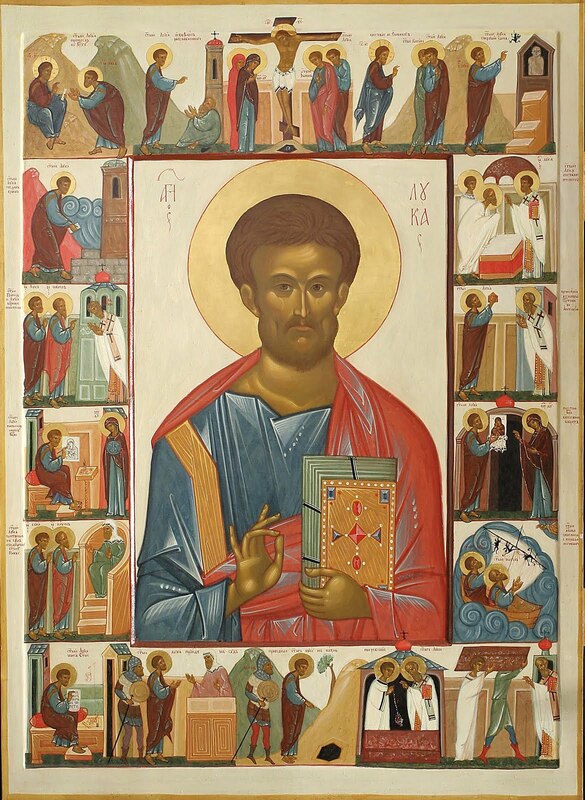 Coming to belief in the Lord, St. Luke was numbered among the Seventy Apostles, and was sent out to preach. With Cleopas, he saw the resurrected Lord on the road to Emmaus (Luke 24). 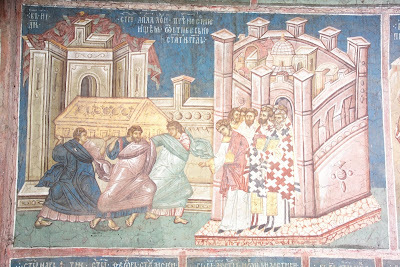 After the descent of the Holy Spirit, Luke returned to Antioch and there became a fellow worker of the Apostle Paul and traveled to Rome with him, converting Jews and pagans to the Christian Faith. Luke, the beloved physician, … greets you, writes the Apostle Paul to the Colossians. (Colossians 4:14). At the request of Christians, he wrote his Gospel in about the year 60. Following the martyrdom of the great Apostle Paul, St. Luke preached the Gospel throughout Italy, Dalmatia, Macedonia and other regions. He painted icons of the Most-holy Theotokos-not just one, but three-and icons of the Holy Apostles Peter and Paul. Hence, St. Luke is considered to be the founder of Christian iconography. The tomb of St. Luke exists to this day in the city of Thebes in Northern Greece, where they continue to celebrate his memory. In fact, every year his tomb gives off a miraculous liquid that performs many miracles, and especially heals people with eye trouble. Was tortured willingly for the Lord. But the world would not have had the great Luke. And surrendered his heart to the Son of God. And in Him he recognized the Immortal Creator. And worked miracles in His name. And Luke sacrificed his mind, wealth and youth to Him. And gave to the world what he received from the Lord. Then the world, fulfilling the Scripture, repaid him with contempt. With a smile on his face and his arms folded crosswise. And received the soul of His Evangelist. 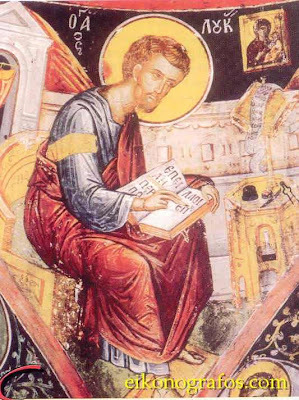 St. Luke prays for the Holy Church. Many icons have been attributed to St. Luke throughout the Orthodox world. Some of these include Panagia "Megalospileotissa", or "of the Great Cave" near Achaia (http://full-of-grace-and-truth.blogspot.com/2008/10/icon-of-panagia-megalospilaiotissa-of.html), Panagia Soumela in Beroia (http://full-of-grace-and-truth.blogspot.com/2009/08/miraculous-icon-of-panagia-soumela-and.html), Panagia Kykkotissa in Cyprus (website of the Monastery in Greek: http://www.imkykkou.com.cy/proskynima_monis.shtml), Panagia of Agiassou (http://full-of-grace-and-truth.blogspot.com/2009/08/miraculous-icon-of-theotokos-holy-sion.html), the Tikhvin icon of the Theotokos (http://full-of-grace-and-truth.blogspot.com/2009/06/appearance-of-holy-tikhvin-icon-of.html), Panagia Malevi (http://full-of-grace-and-truth.blogspot.com/2009/01/miraculous-myrrh-flowing-icon-of.html) and as many as seventy others, according to some sources. 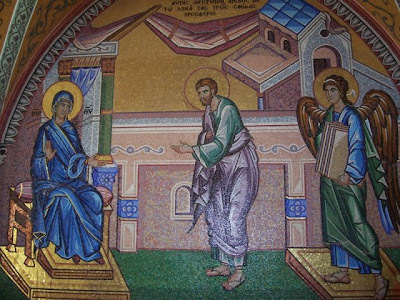 And regardless of whether or not it can be proven that St. Luke actually painted all such icons, endless miracles of the Theotokos continue to occur throughout the world through her holy icons, and the great and holy work of iconography enacted by St. Luke and sanctified through Christ continues to enrich the Church. On a side note, in 1992, then Metropolitan Ieronymos (now the Archbishop of Greece) made a formal request to the Catholic Archbishop of Padua to return a significant portion of the relics of St. Luke to his tomb in Thebes. This ended up prompting a large scientific endevour to determine if the relics in St. Justina's Church in Padua are really those belonging to the Evangelist. 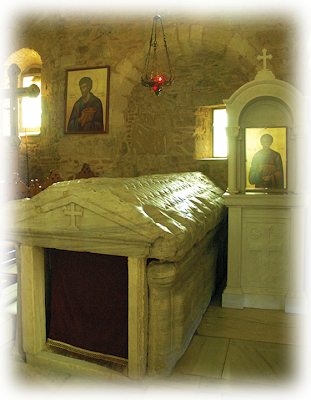 After many investigations, including DNA analyses (which linked the remains to someone of Syriac origin; St. Luke was born in Antioch), C-14 dating, and measurements of the lead sarcophagus, which actually matched the dimensions to the milimeter of St. Luke's tomb in Thebes, it was determined that there was significant scientific evidence that these remains belonged to St. Luke. To honor the Metropolitan's request, the Archbishop of Padua gave the Church in Thebes a rib from St. Luke, and the one closest to his heart. 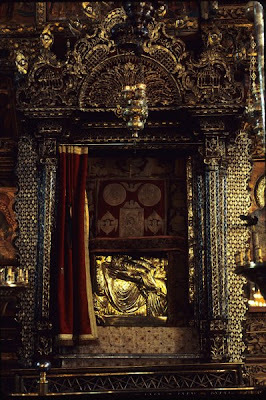 Thus, the Tomb of St. Luke in Thebes also bears a portion of his holy and grace-filled relics. For more information see http://www.telegraph.co.uk/connected/main.jhtml?xml=/connected/2001/10/25/ecnst25.xml. May St. Luke the Evangelist intercede for all of us and help us! Stichera Tone 8. What may we call you. Regarding the icon, it's not mine, so I can't give permission to use it or not. However the link to where I found it is provided, and I don't remember seeing anywhere on the site that its use should be restricted. And as I mention on the sidebar: "Comments that are irrelevant to the topic of the post will be deleted." 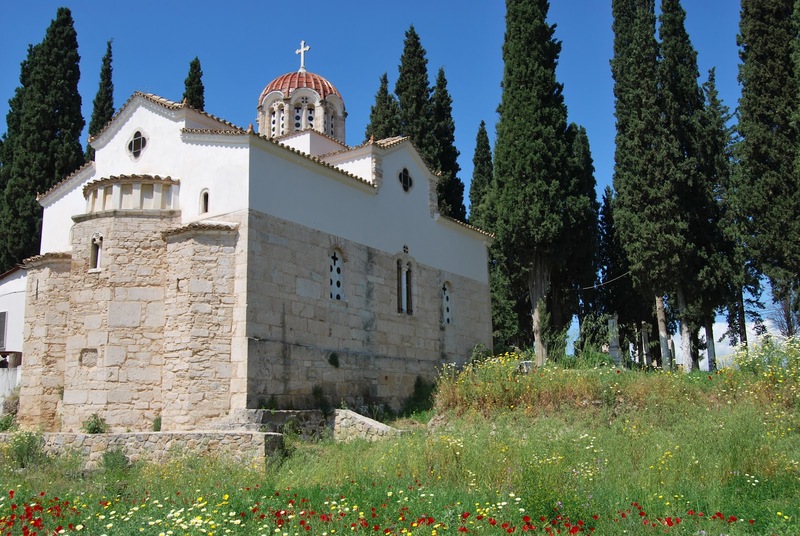 Did you visit the church of St. Luke and his tomb in Thiva personally? 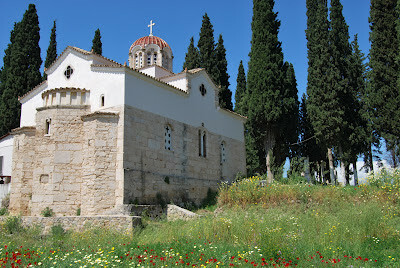 I am planning a trip to Greece in September and would like to visit this church but cannot find it on a map. Do you have any information about its location? I have not had the blessing of visiting the tomb of St. Luke the Evangelist. I wish that things work out for you on your upcoming trip. 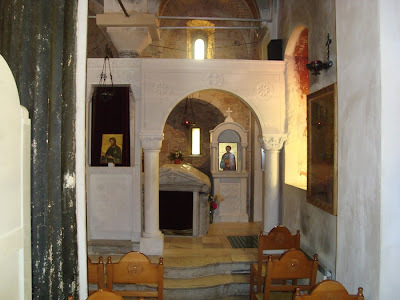 From what I can glean online, the church of St. Luke the Evangelist (where he was buried) is in the 1st Cemetary (i.e. the Old Cemetary) of Thebes (Thiva). It appears to be at the intersection of "Oplarchegou Vogle" and "Anapafseos" streets. Thanks very much! That map is exactly what I needed! You can share it with her because these are not the original images. These are replicas that have lightened to look white. Look up Black Madonna and Jesus and you will see most of these images in it's original state. The Black Madonna (Mary) is who the Pope prays to.